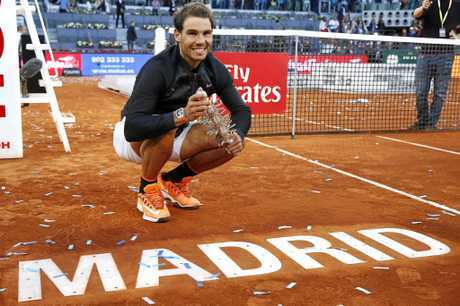 RAFAEL Nadal's flawless record on clay this season continued as he outgunned the impressive Dominic Thiem to win the Madrid Masters for a fifth time 7-6 (10/8), 6-4. And the 14-time Grand Slam champion is now strong favourite to add a 10th French Open crown next month as he romped to victory on home soil for the loss of just one set all week. Victory also moves Nadal above Roger Federer to fourth in the world rankings. "To play here and win here means a lot to me," said Nadal. "I am always very nervous and emotional to play a final in Madrid." Thiem also fell victim to Nadal's supreme form in the final in Barcelona two weeks ago, but there was little for the 23-year-old to be dispirited about as he pushed Nadal all the way in his first Masters series final. Nadal disposed of Novak Djokovic for his first win over the Serb for three years on Saturday and victory saw him level Djokovic's record of 30 Masters Series titles. Thiem didn't finish his semi-final against Uruguayan Pablo Cuevas until after midnight on Sunday morning. However, that lack of recovery time didn't show as Thiem struck the first blow by breaking the Nadal serve to move into a 3-1 first set lead. Thiem handed the break back by netting a simple volley for 3-3, but showed admirable resistance to battle back from 0-40 when serving to stay in the set a 4-5 to force a tie-break. Both had their chances in the tie-break as Thiem again fought back from 3-5 down to have two set points of his own only to be denied by two punishing Nadal forehands. And eventually it was Nadal who prevailed with his fifth set point when Thiem fired long. The marathon first set lasted a minute under an hour-and-a-half and seemed to drain Thiem's belief as well as his energy resources as he was broken to start the second set. Nadal had to stave off a break point on his own serve to consolidate the break for 2-0. Four games without a point against the serve followed as Nadal closed in on victory. Thiem again showed impressive poise to battle back from two match points down at 3-5 to force Nadal to serve out for the title. The Austrian had his chance too to get right back in the match with four break back points, but couldn't take advantage as Nadal finally secured victory with his fourth match point.